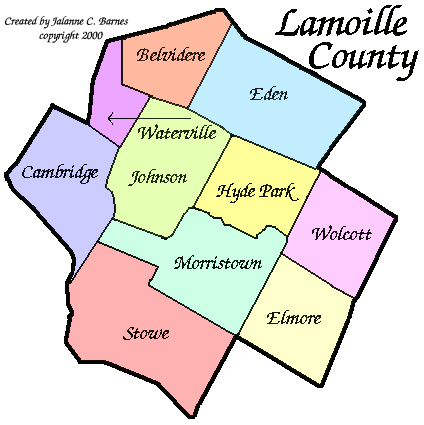 Welcome to Lamoille County in north central Vermont; and, according to the 2010 Census, the third smallest (with 24,475 people) county in Vermont. We're 10 towns strong, with a unique blend of quaint New England villages, world-class resorts, agriculture and commerce, all in a rural setting. Need help finding your away around? Send me a message. Lamoille County is covered bridges, 19th century Victorian manors, New England architecture with its Saltboxes, 2-story Colonials, and steepled Churches; farm-fresh produce, award-winning cheeses, and the best maple syrup in the world. It's a spirit of independence, a respect for individual rights, elbow room, and a place for everyone: secluded swimming holes and pristine mountain tops, quiet country roads, and vast expanses of forest. Vermont government and institutions still have the small-town flavor that makes them accessible to everyone. Lamoille County is a world of aesthetic beauty and cultural vitality, nestled snugly in the Green Mountains, and graced by the splendor of Mt. Mansfield. The Lamoille region has an established reputation as one of Vermont's premier recreation centers, and is within easy commuting distance from the state's largest population and and employment centers. I like it here; I think you will, too. But don't take my word for it, come and see for yourself.